Philips Brilliance CT 10-slice configuration is the proven value leader in its class. 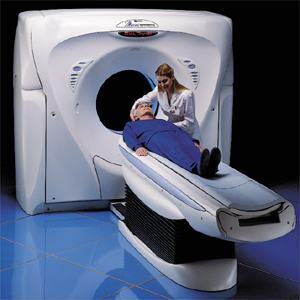 This system enables a wide range of routine and advanced procedures, including gated cardiac studies, functional CT and submillimeter isotropic neuro and orthopaedic imaging. 0.4 second rotation time - submillimeter isotropic imaging capabilities. .0 M.H.U. MRC X-ray tube - provides necessary heat capacity required for longer scan times, allowing for thin slice imaging. Philips-exclusive features empower clinicians with tools that make their jobs easier. For instance, Spiral Auto Start allows technologist to monitor contrast injection to check for extravisation and to initiate and stop scan (with a predetermined delay) while staying in scan room during process. Also, DoseRightTM offers both prospective and dynamic exposure controls to ensure lowest dose with constant image quality. All this adds up to value and versatility in one practical package. 8.0 M.H.U. MRC X-ray tube - provides necessary heat capacity required for longer scan times, allowing for thin slice imaging.